Have you completed a One Page Plan for Personal Success? If so, follow the steps below to take your plan to the next level. 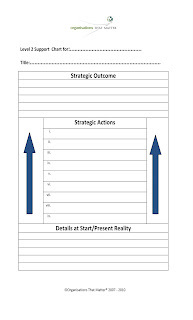 When completing your Plan for Personal Success it is critical that you take each of the main strategies in your Prime Chart and create a Support Chart for them. Support Chart timeframes tend to be less than your prime Chart timeframe. So, if your prime Chart is for ten years, your Support Chart may be for three to five years. Support Charts follow the same structure as your Prime Chart. Complete the Title for your chart. This is the name that you have given the strategy in your Prime Chart. 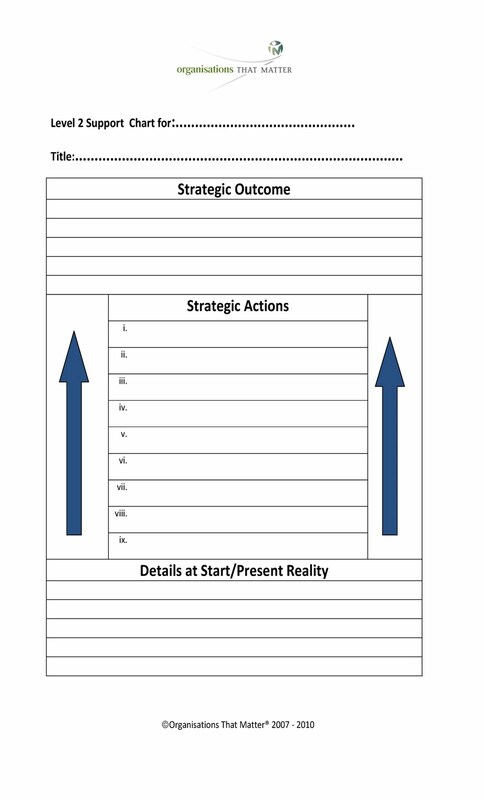 Next identify which one of the Six Vital Strategy areas the strategy directly supports, and write that in brackets next to the name of the strategy. This helps to ensure that when you review all your strategies, you can quickly determine if you have at least one strategy for each of the Six Vital Strategies. Complete your Desired Outcome specific to this strategy. Be clear and as specific as possible. As you did for your Prime Chart Vision, keep asking yourself why you want what you are writing. This helps to uncover your real reason for wanting to achieve this Desired Outcome and usually helps to clarify exactly what it is that you are aiming to achieve. Complete your Starting Point/Current Reality section of your chart. Provide as much information as possible that specifically relates to the Desired Outcome that you are striving to achieve. What is positive about your present reality, and what is currently a challenge. Determine your actions that will move you from your Starting Point to your Desired Outcome. Upon brain-storming actions, review your list and identify which actions will provide the greatest leverage. These become the most critical actions to complete because all the actions will tend to fall into place. Complete this process for each of your Prime Chart strategies and you will take your Plan for Personal Success to the next level. If you would like to know more about creating a Plan For Personal Success, or would like to be individually coached through this process, please contact info@orgsthatmatter.com .